Three Sheets is a travelogue based around the host of the show, Zane Lamprey, traveling the world and learning more about the alcoholic drinks produced in each destination visited. The show presents a humorous view of the major sites and alcoholic drinks an specific city is known for and attempts to inform the viewer of how specific drinks and food items are created, constructed or consumed within the city. During each episode of Three Sheets the initial portion of the show is taken up with Zane Lamprey giving a short guide to the city being visited in that episode. Following this an alcohol producer or local bar will be visited for the host to make and consume specific food and alcoholic drink items. Three Sheets usually takes place over two days in a specific location to allow the host to sample the hangover cures each location is best known for. During each show the mascot of the show, Pleepleuis the monkey, is hidden in different locations. A popular drinking game has grown up with viewers drinking each time Pleepleus is visible within the show. Zane does "beer tosses" and "Jager-bombs" with an equally outrageous bar owner, and explores the drinking games of the international transplants who work the mountain by day, and the bars by night. Zane discovers a remote atoll where they grow the only grapes on earth to have a "coral terroir." There's also pineapple liqueur, island cocktails, beer cocktails and island antics, when Zane goes three sheets to Tahiti. Weather he's drinking "Black Death," moonshine known as "Landi," or candy inspired spirits, Zane discovers that drinking in Iceland is a one of a kind adventure that can only be made better by eating sheep testicles cured in sour milk! It's the birthplace of Greece's great spirit of Ouzo. Zane sees how it's made, and more importantly how it's consumed with locals - and he finds out about the mysterious science behind why water makes ouzo turn cloudy. Zane explores a renowned enclave of pub culture. He finds a pub said to be haunted by King George, has a drinking face-off, and downs a few with a local crime syndicate insider. Zane goes straight to the grounds of the Jagermeister compound. But it doesn't stop there, Hamburg is home to some of the most innovative German cocktails, and it's also home to some salty sailors who like beer and like to play with fire! Three Sheets to anywhere – even Namibia! Zane pulls no punches when he meets up with one of the world's foremost vodka makers. Zane then gets down a dirty with some locals playing drinking games with hammers, saws, spikes and lumber. Ever heard of beer made with cane? Porter made with Coconut? Vodka made with pineapple or ocean water? On this episode, Zane goes local finding out how local ingredients influence Hawaiian drinks in a unique way. Zane holds his own in this rough and tumble country. Zane hits London in search of the ultimate British drinking experience in the epicenter of New Years Eve, Greenwich Mean Time. Zane makes it his mission to have a world-class pub crawl, right in the heart of the United Kingdom. Zane begins his Russian experience at a traditional bath house. He is then greeted with ice cold beer and endless vodka shots. Zane tangos his way though one of the world's most prized wine regions also known as the "Paris of South America." Zane wanders the streets of Bangkok and realizes that to drink in Thailand, you need the right attire. Zane travels to one of the most beautiful regions of France to immerse himself in all things Cognac and learn why this drink has a sophisticated reputation. It's a non-stop party in Barcelona. Zane travels to Edinburgh where he dresses in a kilt. He sips a dram from a $10,000 bottle of whisky and learns the nuances of scotch by a sword welding man (also in a kilt). Zane eats goat udder with ice cold Saigon suds and learns all about "Bia Hoi" ("fresh beer"). He motors around Saigon on the back of a scooter. Zane begins his Viking adventure where he chills out in an ice bar and goes pint for pint of Carlsberg Beer with young Danish guys. Zane battles a cave full of real monkeys in search of his mascot, stuffed monkey "Pleepleus." According to Zane, what happens in Vegas stays in Vegas. Three Sheets is currently available to watch and stream on Mojo. 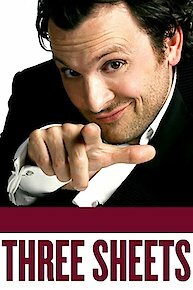 You can also buy, rent Three Sheets on demand at Amazon online.